How do bloggers celebrate New Years' Eve? By creating a "top posts of the year" post, of course! Okay, I'm sure there are a few other ways, too, but I think you know what I mean. Read more about how PostRank works. You can post the widget on your sidebar (a wide sidebar works best) instantly if you use Blogger, Wordpress, or Typepad, or post the script into a blog post, as I've done below. To create the widget for Blogger, simply enter your url, choose a theme, and choose the number of posts you want to display in the list. A few months ago, I talked about using AideRSS to filter your feeds. PostRank is the same company, and they've consolidated everything under the PostRank name. You can still filter your feeds according to whether PostRank views them as "good", "great", or "best". 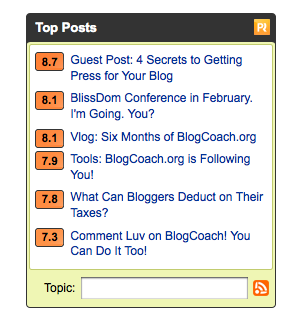 You'll see this in action under "Most Popular" in the near-right sidebar here on BlogCoach.